If you own an iPhone, your SMS needs are covered: Apple’s built-in SMS app works fine (at least until Messages debuts as part of the iPhone 3.0 update). But if you’re rocking an iPod touch, texting requires a little extra effort. That’s where SMS Touch comes in; Michael Schneider’s $3 app aims to bring texting to the Wi-Fi-only crowd. SMS Touch works by looking up the mobile carrier associated with the number you’re texting. Since most carriers in the United States assign a unique e-mail address to each cell phone number (like 7325551212@tmobile.com), SMS Touch can convert your friends’ phone numbers into e-mail addresses. You send an e-mail, and your buddy receives a text message. Sideways Texting: SMS Touch improves on the built-in Text app by adding niceties such as a horizontal keyboard. But essentially, you’re composing an e-mail, as SMS Touch delivers your text message via the mobile Mail app. When you launch SMS Touch, you’re immediately able to compose your message. Impressively—and unlike many of Apple’s current apps—when you rotate the phone between portrait and landscape, the on-screen keyboard adjusts immediately. The pre-iPhone 3.0 version of Mail, for instance, lacks landscape text-entry altogether, and I really enjoy the increased speed and accuracy I get typing on the wider keyboard. You can use the iPhone’s traditional number pad to enter the digits, or access your Contacts to choose a saved friend. SMS Touch smartly also offers quick access to numbers you’ve texted recently. After entering your recipient(s), you can start writing your message. I noticed an occasional display glitch where letters with descenders (like “g”) didn’t display properly and left some visual artifacts, but that annoyance was minor. Before you send, you can run a quick spell check. I find that the iPhone’s auto-correction prevents most typos, but the spell checker still makes a nice addition. It works well enough, though its interface lacks the polish I want from an iPhone app. Once you’re finally ready to send your text message, things get a bit odd with SMS Touch. When you tap Send, the app does its magic lookup, figuring out the right cell phone e-mail address to use to reach your pal. SMS Touch then exits and launches Mobile Mail, pre-populating a message to that e-mail address with your text. You won’t actually SMS your friend until you tap Send again, from within Mail. If your friend replies, you’ll receive a new message in Mail. Replying there continues the conversation. And there’s the rub. SMS Touch works mostly as a “cell-phone-number-to-e-mail-address-converter,” and then hands off the heavy lifting to Mail. Mail works adequately for this light texting, but you lose out on the niceties that SMS Touch offers (landscape typing, spell check) unless you exit Mail and relaunch SMS Touch in between sending Every. Single. Text. I can think of two ways to improve the SMS Touch experience: One would be to turn the app into a simple Contacts updating utility, that would simply allow me to add the mobile e-mail address for any contact I have with a cell phone number. Although that would entail missing out completely on the app’s nice texting interface, it would let you satisfy all your SMS needs from within Mail, eliminating the annoying switch back and forth between apps. The other way to improve SMS Touch would be to handle all the sending and receiving from within the app itself. That introduces some potential privacy concerns, unless you could provide your own mail server information to use. Two final notes on the app: Instead of a true manual, it includes a link to a YouTube video that walks you through SMS Touch’s features—a clever approach. And if you plan to text many different individuals, be warned: SMS Touch has an artificial limit of 100 recipients that you can send messages to from the app. As it is, although the SMS Touch interface itself works well, the clunky app-switching entailed by frequent use won’t work as a long-term solution for anyone planning to send more than a couple texts a day. 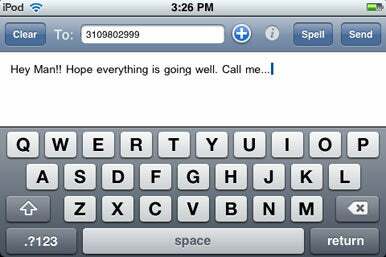 And with the iPhone 3.0 improvements coming to Apple’s built-in apps, some of SMS Touch’s niceties may soon be eclipsed. SMS Touch is compatible with any iPhone or iPod touch running the iPhone 2.2 software update.